New for June 2008! This page is in response to a question posed by a reader named Steve... what's the difference between a frequency converter and a frequency translator? A frequency converter either has a nonlinear property that messes with a sine wave such that harmonics or subharmonics are generated, (a multiplier or a prescalor). Otherwise it uses a second signal to beat against the first one to generate frequency products (a mixer). In most cases these are "dumb" circuits that require no power supply or control. A frequency translator is a different animal. It uses a phase shifter, which is actively controlled to change the phase of the signal periodically, for example every 10 nanoseconds another 10 degrees of phase is added. Phase is the first derivative of frequency, if you change phase at a constant slope you are adding a frequency component to the signal. Going back to the example of 10 degrees every nanosecond, that represents a full cycle after 36 nanoseconds, this is a signal of 28 MHz. If you apply this to a 10 GHz signal you get either 10.028 GHz or 9.972 GHz at the output depending on whether you translate it in positive or negative phase-slope fashion. Thanks to Chard for correcting our algebra! The frequency converter requires a phase shifter that can muster 360 degrees in some smaller increment, a controller circuit that times the phase shift on command by the system. Problems with frequency translators are that the signal won't be completely clean at the output, it will have the original "carrier" frequency present as well as sidebands, perhaps down by 20 dB from the desired signal but present nonetheless. In most cases the phase shift will be accomplished digitally, i.e. there will be discreet phase bits. The smaller the LSB (least significant bit) the cleaner the output signal. The phase noise of this type of circuit must be horrendous, however, we're speaking from ignorance on this topic. Say, wouldn't it be great if we had a spreadsheet that demonstrated frequency translation...? We just did that! Here's an example of a 10 GHz wave where we've advanced the phase 40 degrees every 0.5 nanoseconds, or a full wave after 4.5 nanoseconds. The first 500 picoseconds the input and translated wave are on top of each other, then they start to diverge. 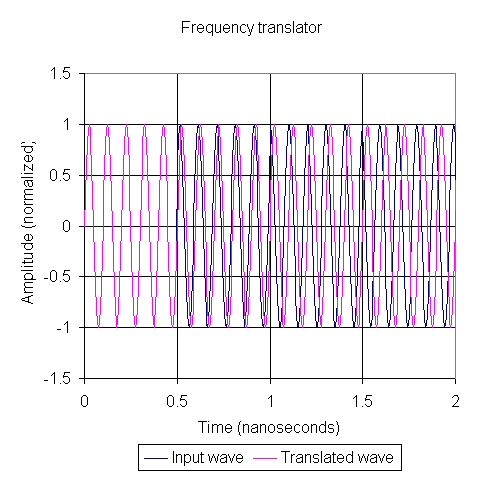 The output frequency is the time average of the waveform (instantaneously it is still 10 GHz). In this case we have shifted it to approximately 10.222 GHz. If anyone wants the spreadsheet that created this plot, it's available in our download area for free!